Tappan Zee Constructors (TZC) is scheduled to continue roadway improvements near the Governor Mario M. Cuomo Bridge next week. The work requires single-lane closures on the New York State Thruway (I-87/I-287). Mon. 4/8 10 a.m. – One left lane 4 p.m.
Construction of the shared bicycle and pedestrian path continues at the Rockland Landing. Construction of a new intersection at Hillside Avenue and Route 9W is being facilitated with a temporary traffic pattern. All motorists exiting the Thruway at exit 10 (South Nyack) are being directed use the ramp that recently went into service. 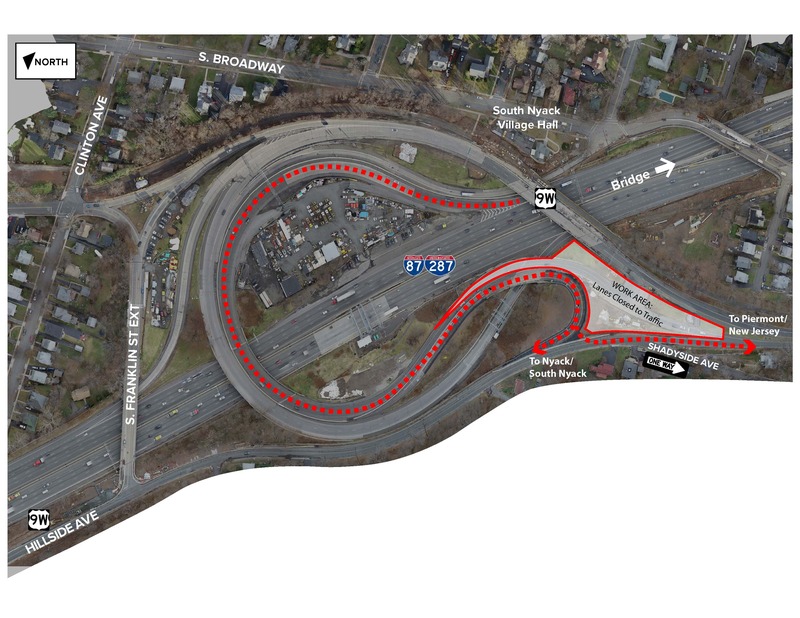 Those headed toward Piermont and New Jersey must turn left onto Hillside Avenue/Route 9W southbound at the end of the ramp (see graphic below). Motorists turning left must first come to a full stop. Local traffic to the Nyacks continue to bear right, connecting them to Hillside Avenue to Route 9W northbound. Additionally, motorists are temporarily unable to access Hillside Avenue from Shadyside Avenue. Those looking to head north on Hillside Avenue to 9W northbound are being detoured to South Boulevard and South Highland Avenue. Detour signs are currently in place. Motorists are still able to access Shadyside Avenue from Hillside Avenue (southbound, up the hill). The temporary traffic pattern will remain in effect for several months. On the bridge, TZC will continue to place rebar, pour concrete, strip forms and install glass panels on the northern side of the westbound span for the bridge’s shared-use bicycle/pedestrian path, barrier and overlooks. At the Westchester Landing, foundation construction continues on the terminus site walls, the nearby storage building and canopy area. Operations include rebar installation, excavation, pouring concrete and light pole installation. Periodic partial closures of the main navigation channel are anticipated to continue during the demolition period, as TZC continues to dismantle the Tappan Zee Bridge’s west anchor span and salvage the collapsed east anchor span. Cranes, barges and other equipment will occupy parts of the channel during this time. Boaters are strongly encouraged to avoid the project site during the closures and to avoid the Regulated Navigation Areas, located east and west of the main channel.